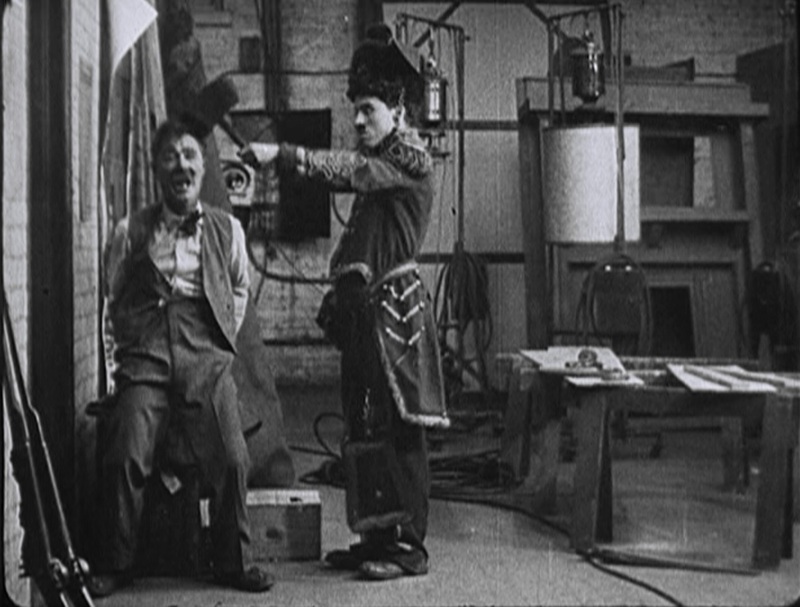 For his first movie at Essanay studios, Charlie Chaplin decided to lampoon Keystone Studios and have a bit of an in-joke for his fans with the title. He was already being paid better, given more creative freedom, and working in a longer format, but apparently the cold weather of Chicago in January didn’t agree with him, and he soon relocated back to California to resume working there. In this movie, Charlie shows up for “open auditions at Lodestone studios,” looking for extra work. He flirts with an aspiring actress, feuds with the (male) production assistant organizing the interviews, and knocks out fellow-extra-wannabe Ben Turpin several times. He manages to get hired, in spite of some amusing confusion with the studio head’s hearing aid, and goes over to the set, spoiling a shot. To get rid of him, the director sends him over to work with the carpenter, leading to the usual physical comedy with board and mallets, etc. Then the director fires one of the uniformed actors and tells Charlie to get a costume. He can’t find one, so he borrows one from the absent star’s dressing room. Then he proceeds to foul up several scenes, bending his sword out of shape, nearly knocking over the set, and tearing the female star’s dress. 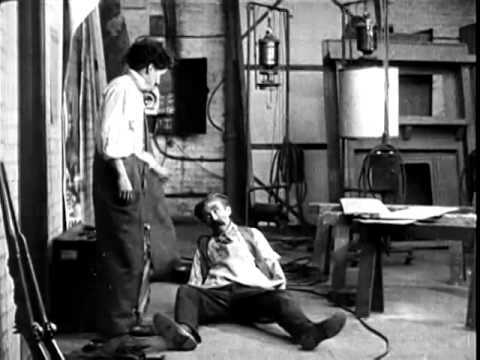 Finally, the star shows up and find him in his costume, leading to a Keystone-style confrontation with him, the carpenter, the director, Ben Turpin, and Charlie. Guess who wins? As we might expect, this first effort in an unfamiliar studio is lighter than the better work Charlie would go on to during 1915, but it already shows some improvements. Charlie’s character is still quick to violence and mayhem, but he’s already developing that playful shrug that would become his sympathetic gesture. The gags are better developed and there’s a bit more running humor involved. 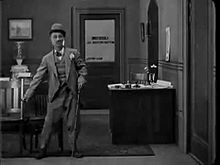 Still, it’s not much above “The Masquerader” or “A Film Johnnie,” and lacks some of the hooks that make those films so memorable (like cross-dressing and seeing the inner workings of Keystone studios). There are some interesting tracking shots, mostly used to take the audience “into” the scenes Charlie is ostensibly shooting from behind the camera, and one tracking-backward shot to follow him and the female lead as they walk up-set. There are no real close-ups, and we don’t even get a good look at Turpin’s trademark crossed-eyes. The editing is pretty standard for the time as well, with just a bit of cross-cutting to get characters into the same scene together. Apparently, Gloria Swanson auditioned for the film (she would have been just fifteen at the time), but Charlie wasn’t impressed, so she was relegated to playing a typist in the background.